A fossil trackway is a type of trace fossil, a trackway made by an organism. Many fossil trackways were made by dinosaurs, early tetrapods, and other quadrupeds and bipeds on land. Marine organisms also made many ancient trackways (such as the trails of trilobites and eurypterids like Hibbertopterus). Specialized marine trace trackway, Yorgia, from the Ediacaran of northern Russia. The majority of fossil trackways are foot impressions on land, or subsurface water, but other types of creatures will leave distinctive impressions. Examples of creatures supported, or partially supported, in a water environment are known. The fossil "millipede-type" genus Arthropleura left its multi-legged/feet trackways on land. Some of the earliest trackways for human ancestors have been discovered in Tanzania. The Laetoli trackway is famous for the hominin footprints preserved in volcanic ash. After the footprints were made in powdery ash, soft rain cemented the ash layer to tuff, preserving the prints. The hominid prints were produced by three individuals, one walking in the footprints of the other, making the original tracks difficult to discover. As the tracks lead in the same direction, they might have been produced by a group — but there is nothing else to support the common reconstruction of a nuclear family visiting the waterhole together. In South Africa, two ancient trackways have been found containing footprints, one at Langebaan and one at Nahoon. Both trackways occur in calcareous eolianites or hardened sand dunes. 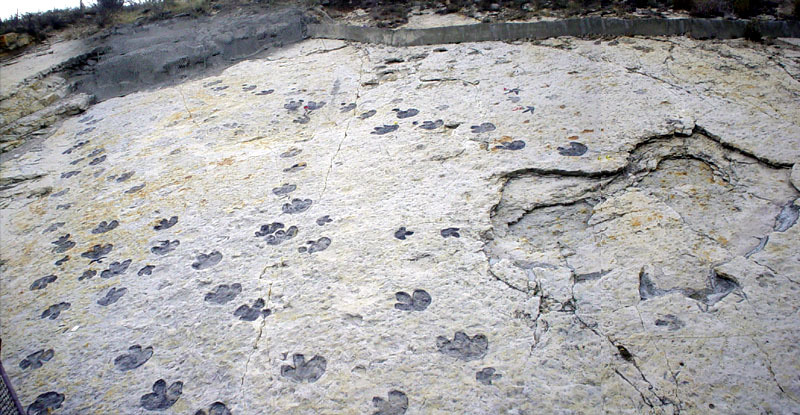 At Nahoon, trackways of at least five species of vertebrates, including three hominid footprints, are preserved as casts. The prints at Langebaan are the oldest human footprints, dated to approximately 117,000 years old. Twenty six human fossil trackways have been found in the Willandra Lakes area adjacent to Lake Garnpung, consisting of 563 human footprints from 19,000 to 20,000 years ago. The earliest land creatures (actually land-marine coastal-riverine-marshland) left some of the first terrestrial trackways. They range from tetrapods to proto-reptilians and others. A possible first connection of a trackway with the vertebrate that left it was published by Drs. Sebastian Voigt and David Berman and Amy Henrici in the 12 September 2007 issue of Journal of Vertebrate Paleontology. The paleontologists who made the connection were aided by unusually detailed trackways left in fine-grained Lower Permian mud of the Tambach Formation in central Germany, together with exceptionally complete fossilised skeletons in the same 290-million-year-old strata. They matched the two most common trackways with the two most common fossils, two reptile-like herbivores known as Diadectes absitus (with the trackway pseudonym Ichniotherium cottae) and Orobates pabsti (with the trackway pseudonym of Orobates pabsti). The Permo-Carboniferous of Prince Edward Island, Canada contains trackways of tetrapods and stem-reptiles. Macrofloral and palynological information help date them. Ireland hosts late Middle Devonian tetrapod trackways at three sites on Valentia Island within the Valentia Slate Formation. The earliest fossil trackway of primitive tetrapods in Australia occurs in the Genoa River Gorge, Victoria, dating from the Devonian 350 million years ago. Dinosaurs lived on the continents before grasses evolved (the "Age of the Grasses" evolved with the "Age of the Mammals"); the dinosaurs lived in the Triassic, Jurassic, and Cretaceous and left many trackways, both from plant-eaters and the meat-eaters, in various layers of mud and sand. With scientific analysis, dinosaur specialists are now analyzing tracks for the walking-speeds, or sprint-running speeds for all categories of dinosaurs, even to the large plant eaters, but especially the faster 3-toed meat hunters. Evidence of herding, as well as pack hunting are also being investigated. An example trackway from Africa is a trackway in 140 Ma rose-coloured sandstone of Chewore Area, Lower Zimbabwe Rift Valley. The small footprint size, with both manus and pes implies that it is a trackway of a juvenile, a probable carnosaur. Probable Dilophosaurus footprint from Red Fleet State Park, northeastern Utah. The Gansu dinosaur trackway located in the Liujiazia National Dinosaur Geopark in Yanguoxia, China contains hundreds of tracks including 245 dinosaur, 350 theropod, 364 sauropod and 628 ornithopod tracks among others. Mammal trackways are among the least common trackways. Mammals were not often in mud, or riverine environments; they were more often in forestlands or grasslands. Thus the earlier tetrapods or proto-tetrapods would yield the most fossil trackways. The Walchia forest of Brule, Nova Scotia has an example of an in situ Walchia forest, and tetrapod trackways that extended over some period of time through the forest area. A recent marsupial trackway site in the Colac district of Australia (west of Colac) contains marsupial trackways as well as kangaroo and wallaby tracks. Petalichnus, arthropod walking traces. Devonian of northeastern Ohio. Moa footprints near the Manawatu River, New Zealand. Wikimedia Commons has media related to Trackways fossils. ^ Westaway, Michael C.; Cupper, Matthew L.; Johnston, Harvey; Graham, Ian (June 2013). "The Willandra Fossil Trackway: Assessment of ground penetrating radar survey results and additional OSL dating at a unique Australian site". Australian Archaeology (76): 84–89. JSTOR 23621961. ^ Science Daily, "Who Went There? Matching Fossil Tracks With Their Makers", 15 September 2007. ^ Stössel, I. 1995. The discovery of a new Devonian tetrapod trackway in SW Ireland. J. Geol. Soc. Lond. 152, 407–413. ^ Warren, J.W. & Wakefield, N.A., 1972. Trackways of tetrapod vertebrates from the Upper Devonian of Victoria, Aust. Nature 238, 469-470. ^ Dinosaur Hunting in Wyoming, photo: trackways for presentation. ^ Fujita, Sato; Lee, Yuong-Nam; Azuma, Yoichi; Li, Daqing (2012). "Unusual Tridactyl Trackways with Tail Traces from the Lower Cretaceous Heikou Group, Gansu Province". Palaios, Society for Sedimentary Geology. 27 (8): 560–570. doi:10.2110/palo.2012.p12-015r. JSTOR 41692731.